As you can probably tell, I'm a fan of Marty Neumeier. Marty's Brand Gap book is a must read in my opinion. 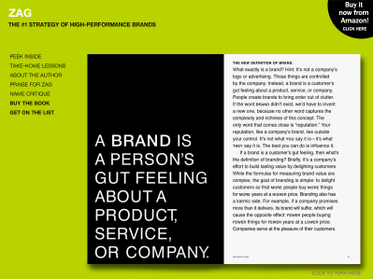 His insights into the brand and design worlds are brilliant and incredibly cohesive. He's a master communicator. Next on my to-read list is his latest book titled "Zag". Check out the simple but effective site used to promote this book. I'm not usually a fan of the "page turn" technique, but in this format it really works. And the direct link to Amazon is effective. Sometimes innovation is plain simple. There's nothing about this that is over-thought. I'm looking forward to the read. Maybe I'll pick it up this weekend.